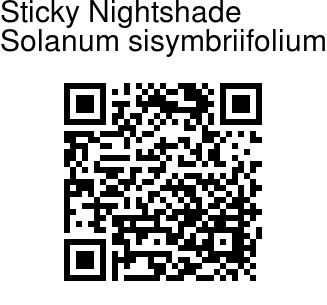 Sticky Nightshade is a densely prickly perennial herb, native to South America. 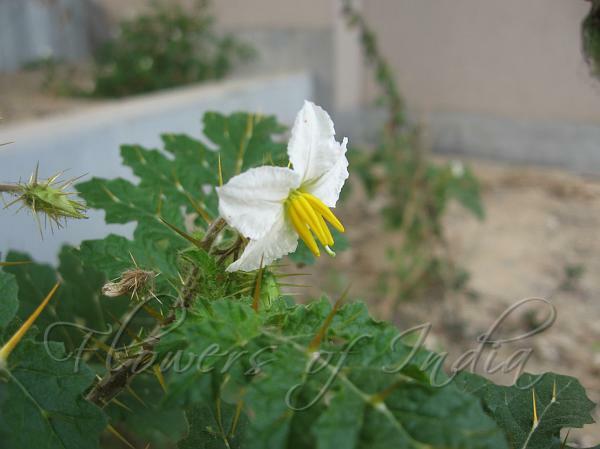 It has naturalized in parts of India. Leaves are pinnately cut into lobes. Leaves are up to 30 cm long, segments up to 10 cm long, on 10 cm long stalks. Leaves have thorns on the ris. Even the sepals are armed with yellow prickles. The sepals grow to 1.5 cm long during fruiting period. Star-like flowers are purplish or white, 1.6-3.5 cm across, with ovate petals, 1 cm long, 4-8 mm wide. Filaments are about 1 mm, with prominent yellow lance-shaped anthers, about 9 mm long. Fruit is a berry, looking like a small tomato, red in color, and finally turning yellow, 1.2 cm in diameter.